First, allow me to take a few moments to thanks everyone involved in this project and explain why we decided to pursue this endeavor. First off thank you to Mr. C for finding the chassis on Craigslist whilst searching for BMW motorcycles. Thankfully the seller included the keyword "motorcycle" as he was open to trades. We probably wouldn't have stumbled on the 318it (sic) if it wasn't for the trade opportunity keyword. The 3 main players to actually perform the work were: Kassel Performance in York, PA, BimmerBuddies in Middletown, PA, and Chris S. of BimmerLabs in WA. 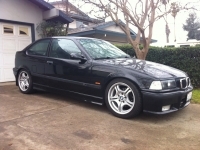 All 3 were critical in actually taking the idea of swapping the N52 into the E36 318ti shell. How it all happened: As previously mentioned we found the shell on CL with 50k original miles. It was a factory Alaska Blue MTech automatic with an overheated M44. This presented an ideal shell for our project. We considered intially swapping an S52, S54, N54, N20, but the N52 prevailed for several reasons. Number one, it was going to be a challenge. To our knowledge no one has successfully run the N52 in any other chassis than it was originally designed to be in, while utilizing the stock ECU and no other associated modules. Aside from the electronics, the electric water pump, power steering, 6speed, etc, all posed new hurdles to overcome. The following post will help to describe the process and I will do my best to answer any questions. The second reason to swap the N52 was for efficiencies. The 318ti represented efficiency. It was an affordable, practical, light, nimble, spacious compact and we intended to maintain this factory feel only with a modern drivetrain. The aluminum/magnesium N52 actually weighs less than the iron block M44 that was pulled from the shell. The electric water pump removes parasitic loss from turning the belt driven pump on the M44. The new alternator has a clutch design intended for again less parasitic draw and better overall MPG. In stock form the N52B30 makes a healthy 231HP and is rated at 29MPG on the highway. Our power goals were quite higher than the stock 325 output and we were able to achieve nearly a 70HP gain due to hardware and software changes. On to the actual specifics of the swap! Vehicle started as a 1997 AlasakaBlau Mtech - Auto. Purchased with a bad M44 and wanted to build something unique. 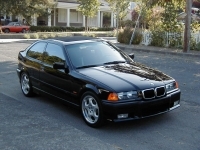 We started searching for a drivetrain and landed on a 2006 Z4 3.0si The full car was purchased as we thought it would be ideal to have the entire car so we could utilize as much or little as we needed. The Z4 was purchased as a base as it is more similar to the E46 which is similar to the E36. After removing the engine from the stand, we decided to use a new single mass flywheel conversion from Valeo along with a sprung clutch disc. The original flywheel had some unwanted play in it and though it would be a good idea to replace. We wanted to use the 6 speed manual, so we bolted the 6 speed to the engine and carefully lowered the assembly into the ti. It was a very tight fit with the transmission attached but it did indeed clear without any contact to the body. The engine nestled into the E36 bay very nicely. We wanted it to sit as close to the firewall as possible so we ran stock mounts rotated 180 degrees onto the Z4 engine arms. A transmission bracket kit was fabbed for the 6 speed and can now be purchased from Kassel Performance. The stock 318ti rear driveshaft was used along with a stock front Z4 auto shaft and guibo. In the photos below, a stock 6 cylinder airbox was mocked up and later replaced with a modified version of the Z4 airbox. Mechanically, this pretty much sums up the actual fitting of the drivetrain into the ti: N52, new stock motor mounts rotate 180 degrees, stock 6 speed transmission, ti rear portion of driveshaft with Z4 auto front half. The small case diff was also changed out for a built 3.46 with the Thayer 3 clutch pack kit. New finned MZ3 cover was installed as well. Moving onto hydraulic things. As mentioned above, the Valeo SMF kit was used. A custom short shifter from and clutch line were supplied by Rogue Engineering. Manual pedal box and new OE hard lines were installed from a manual 318ti. E36 M3 clutch master and E90 330 slave cylinders were used. A new larger bore E36 M3 brake master was also installed. One of the brake line fittings needed to be switched at the brake master to accommodate the M3 part. We used a new fitting and re-flared the line. Steering. We used the E90 330 steering pump, idler, and belt. The Z4 did not have a belt driven pump. 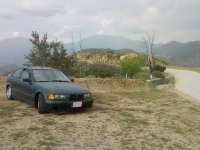 New E36 328i lines were used along with new power steering reservoir. Everything was mounted to existing tabs on the chassis. Easy enough. The Z4 ECU controlled electric fan was then used. The upper bracket portion needed to be lightly trimmed as it made contact with the small factory oil cooler. *The engine mounted oil-to water heat exchanger is very much optional and is not required. The fan was wired per the E90/Z4 and is controlled via the ECU. Fueling. The stock fuel pump was replaced by a drop in Walbro 255 provided by Kassel. The machined sleeve is manufactured to drop into the stock hanger with no modificaiton. An E46 M3 S54 fuel pressure regulator and fuel filter were used ad mounted in the stock E36 location. The fuel pressure regulator from the M3 was used as the E90 uses an intank 5bar regulator. The M3 regulator is also has a 5 bar diaphragm and is a return style with a single feed line to the N52. A longer quick connect fuel line from the regulator to the fuel rail was used as the stock E90/Z4 hose was too short. Last edited by 95///M3; 05-22-2017 at 05:32 PM. Exhaust. We decided to switch out the the stock headers for a set of AA headers. This of course was AFTER the engine was already in the E36 chassis. Not smart. Somehow, the stock headers can be rather easily removed the cat-less AA headers can be installed in the E36 chassis with no real trickery. On top of it all the headers just BARELY clear the E36 frame and fit quite well even though they were not designed for this generation of 3 series. We dodged a bullet on this one. As an aside note, the N52 is a rather loud engine, especially with the aftermarket headers. Much louder than S52, S54 that we are more used to installing. The goals for the exhaust were to keep it 'whisper quiet' until full open throttle. We utilized all 304 SS dual 2.25" piping for the exhaust build. The secondary tubes were kept separate to keep torque up and run into stock secondary catalytic converters from the Z4. They then were merged into an X pipe just before the subframe. We then split the subframe and went into a pair of FlowMaster Super HP-2 mufflers (12412304). Finally we crossed the pipes back around to a custom dual 2.25" inlet to 2.5" outlet SpinTech muffler designed to fit our space and noise constraints. A single 3" stainless tip was used to exit though the factory MTech diffuser. Wiring/Electrical: The N52 wiring was not overly difficult. An electronic throttle pedal and associated wiring needed to be added chassis side along with the E90 EKPS (fuel pump relay) wiring. A dual function E36 coolant temperature sensor was mounted in the stock location to feed the signal to both the ECU and cluster. A CAN-BUS controller was built to intercept the check engine light signal, oil level signal, and to control the AC compressor. The N52 does not use a traditional oil dipstick so we wanted a way to monitor oil levels. The CAN-BUS signal is intercepted and converted to a signal for the cluster. The stock 6 cylinder MPG gauge was replaced with a custom dial from E30Dad to display the oil level. The 6 cylinder cluster was also reprogrammed to the stock chassis mileage at the same time by Kassel Performance. Finally the stock MSV70 ECU was flashed to override EWS and all other associated E90/Z4 modules (BimmerLabs/Kassel). Power: We upped the stock power via a few performance modifications. The 3 stage intake manifold was used from a 330, Z4 3.0si, X3 si, etc. This is a bolt on modification. The stock headers were removed in favor of the AA headers as pictured above. We also used CobraMarty's machined Valvetronic shims. All of this coupled with dyno tuning resulted in a substantial HP gain. Car will be back on the dyno this Spring for final conclusive numbers. Thanks to: Kassel Performance, BimmerBuddies, BimmerLabs, Rogue Engineering, Active Autowerke, Thayer Diffs, Renewed Finishes, UrbanWerks. A few other neat little details worth discussing. The factory E36 X-Brace fit and cleared the N52 with no modification. It was close, but did clear by a few MM's. A Motion Motorsport underpanel was used to improve aero and add some rigidity to the bumper. 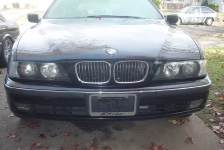 E36 M3 OE front bumper lip was added to protect the factory bumper paint. In the event of any front end scraping, the lip can easily be replaced. A Lithium Ion battery was re-located to the trunk area where the spare tire tools are located. The new battery weighs under 2kg and we have about 1,500 miles of testing on it. No issues with extended periods of sitting or cold starts. Battery used was: WPS Featherweight Lithium Battery HJ51913-FP-IL. Non ti E36 power cables were used to route through the cabin to the battery junction box. AWESOME build. I love the details. Very professionally done swap. That rear exhaust is quite a genius design and unsuspecting. What is the current suspension setup? And how does it drive compared to the S52/54 swaps? Dyno sheet? This is an incredible build. Awesome job! The N52 is an outstanding motor. My dad had 2 128i coupes and the motors in them were buttery smooth. Too bad BMW replaced them with a Turbo 4 that sounds like a canal boat. Is there a video of this car running anywhere? I'd love to see it. Last edited by Diavel; 12-14-2017 at 03:10 PM. Comments like this are completely unnecessary and pointless. Please leave if that is all you have to say. Last edited by anassa; 12-19-2017 at 07:03 PM. 98 318ti Morea Green "Base"
hi gentlemen, very very great job, really great respects to them.....i know that because i m doing the same job on my 318 ti in e46 model, precisely its an n52 from 630 e63 of 02/2007 and im having some issues in the electonics. im using stock ecu (with its CAS and key fob) wired as it was originally in the e63 but with out the other units (KGM, ELV,...), what do you think 95///M3? Excellent Swap! I wonder if it would pass California SMOG. If it would it would be an Awesome Cali car.